As B and I made the final edits on our newest release, Davy’s Last Ride, I couldn’t help but think about all we have accomplished, despite living thousands of miles apart. We hope to make that goal of working together in person a reality one day, but in the meantime, we’ve worked out a system for writing and editing virtually. From the reviews Brit Darby’s gotten so far, I think we’re doing a good job. Solo authors who are mulling over the thought of collaborating with another author often ask how we do it. There are probably many ways to tackle writing as a team, but here’s what works for us. I generally start the ball rolling on our books, writing the first draft. I concentrate on the main plot line, developing the hero and heroine with some of the secondary characters as well. My writing partner and I talk up front enough to pick a general time period and setting, but the actual dates stay somewhat flexible at the outset. That will change once B gets the first draft. Then she digs into the historical research, settles on a specific era and adds real life folks from history to our cast of characters. Often the first draft I do is barebones, mostly dialogue. The plot is there, but must be put under a mental microscope in later edits to ensure tightness and clarity, especially as other characters or plot elements are added or taken away. As a visual person, I play out scenes in my head, making certain the choreography is precise and correct. When B gets the book back, she adds the historical references and tweaks things like speech or jargon of that era, and add descriptions of historically accurate items. It’s a fine balance so we go back and forth numerous times. As our books tend to have fantasy elements, I let my imagination take me where it may – no holds barred. I research legends and tales to add tidbits of flavor, but the in-depth, nitty-gritty research is B’s specialty. Her love of historical clothing allows her to dress our characters accurately, and the kernels of real historical events she finds to blend into our stories work amazingly well. 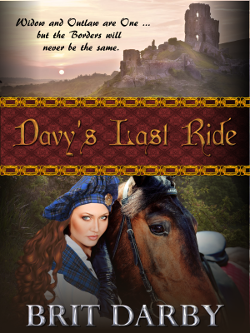 Maybe it’s this combination of fantasy and historical facts that works so well in Brit Darby’s books. Back and forth the book goes, each of us taking a turn to write and edit. Long emails flow between us as we discuss specifics and come up with solutions to the challenges. Having two people, two sets of eyes, two minds picking apart the flaws, and coming up with fresh ideas from different perspectives, not to mention two heads fixing the problems, is definitely a plus. It’s not always easy. Every book is different. 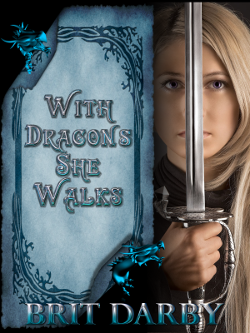 Davy’s Last Ride seemed like mental torture at times, while With Dragons She Walks came together with less struggle. Why that is, I haven’t got a clue. It’s the nature of the writing beast, I suppose. But as we continue our venture of team writing, I’m sure we will find better ways to write even better books. After all, that’s the goal of most writers, to make each book better than the last.